Enjoy crisp, 4K from the comfort of your patio with this black 65-inch outdoor TV from SunBriteTV. The 4K technology provides dramatic detail with 4 times the resolution as conventional HD, while the LED backlighting and anti-glare technology allow you to watch with ease. The screen delivers a picture three times as bright as an indoor TV, making this TV suitable for partial sunlight conditions. 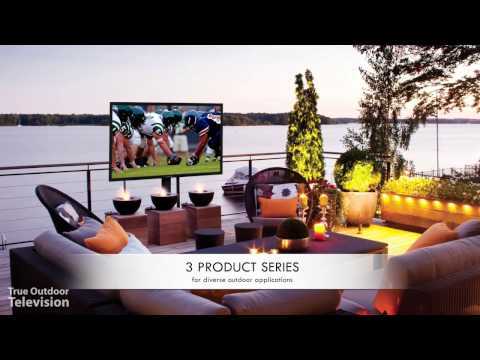 This TV is built for permanent outdoor installation with a durable aluminum casing to protect against weather and insects, and can be used in temperatures from -24 degrees to 122 degrees Fahrenheit. Built into the TV is a HDBaseT receiver with an Infrared repeater, which allows you to receive 4K video over a single Ethernet cable. The SunBriteTV OptiView features provide you with pre-configured settings to optimize your picture for daytime or nighttime, so you can have a perfect picture anytime. VESA compatible. SunBriteTV warrants that this product conforms to the manufacturers specifications and will be free of defect in material and workmanship for a period of two (2) years from the date of sale for both residential and commericial installations. This warranty covers failures due to defects in material or workmanship that occur during normal use, and should any defect occur, SunBriteTV will, at its option, repair the product using new or re-certified parts or replace the product with a new or recertifed product. WARNING: THIS PRODUCT CONTAINS CHEMICALS INCLUDING STYRENE WHICH IS KNOWN TO THE STATE OF CALIFORNIA TO CAUSE CANCER, AND BISPHENOL A (BPA), WHICH IS KNOWN TO THE STATE OF CALIFORNIA TO CAUSE BIRTH DEFECTS OR OTHER REPRODUCTIVE HARM. FOR MORE INFORMATION GO TO WWW.P65WARNINGS.CA.GOV.